Where traditional euphoniums played in British brass bands have three valves on the top, and a fourth on the side, I have always found these difficult to play for longer periods of time; the layout leaving my right hand in an uncomfortable high position. Having played front-valve tubas for a number of years and finding them far more comfortable to play, I wanted Wessex Tubas to bring something different to the metaphoric ‘table’; something that would combine the beautiful tone of the British style Euphonium, with the superior ergonomics of an American style Baritone, whilst ensuring the utmost comfort for the player. This is where our journey began to developing the new Wessex ergonomic euphonium. Previously, the only front valve euphonium available was of European origin - made in Switzerland and costing as much as a small car! I didn’t want us to copy that, of course. I wanted us to develop our own, unique design. Then, a couple years ago, I came across an old and rare Besson euphonium from the 1950's which, very unusually, not only had front valves but also a forward bell! I snapped that up immediately as, when developing a new instrument, it is always better to have a starting point from which to develop, rather than a blank sheet of paper. Most brass instruments introduced in the last 150 years have been developments of what has gone before - a continued process of evolution. I worked with the factory Production Manager on the brief very closely; keeping the bell, bows, taper and valve bore of the excellent playing Wessex EP100 Dolce Euphonium, whilst combining them with a valve and slide layout similar to that of that old Besson. In that form, the prototype was built and exhibited at ITEC (International Tuba and Euphonium Conference) in Knoxville, Tennessee, in June 2016. Feedback on the first prototype from some of the best Euphonium players in the world was that it sang well in the high register, but the low register was stuffy and nowhere near as good as the Dolce Euphonium. After receiving this feedback, we started to review the design - comparing all aspects of this prototype with the successful Dolce to find what might be causing the deficiency. The thing that really stood out to us after close inspection was that the 4th valve circuit had an additional loop which might well be causing the reported stuffiness. Following this revelation, we then examined how to re-design this, and came up with the wonderful idea of changing the tubing to sit above the valves, instead of looping around below. After the plans were redrawn we noted this would also allow a more open wrap of the 3rd valve circuit, and so the second prototype was built with both these changes. The effect was tremendous! Instead of being stuffy in the low register, if anything the new EP104, which by now we had named the ‘Festivo’ played better than the ‘Dolce’! The new Festivo really sings, aided by the new 11” bell, and responds better than we could ever have hoped, with almost perfect intonation throughout. I think the secret of its great playing may be that by having the valves horizontal, rather than vertical - there are less bends in the tubing to disrupt the airflow. The Wessex ‘Festivo’ can be played operating the 4th valve with the little finger of the right hand, as American players are used to doing on tubas, or by the left hand with easy reach around for British players, or those used to a traditional euphonium. 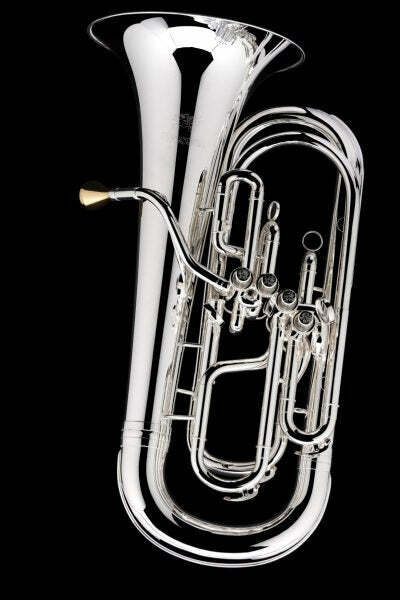 Wessex Tubas is very proud to introduce this new euphonium to the world! I would urge euphonium and baritone players to give it a try and see how you like it, particularly if you are suffering any discomfort in your right arm or shoulder. It is also ideal for tuba or trombone players that want a euphonium for doubling in the orchestra. The left pointing bell will fit in with the ensemble better and project more clearly. The Festivo will be available from late May 2017 and can be ordered on-line here.